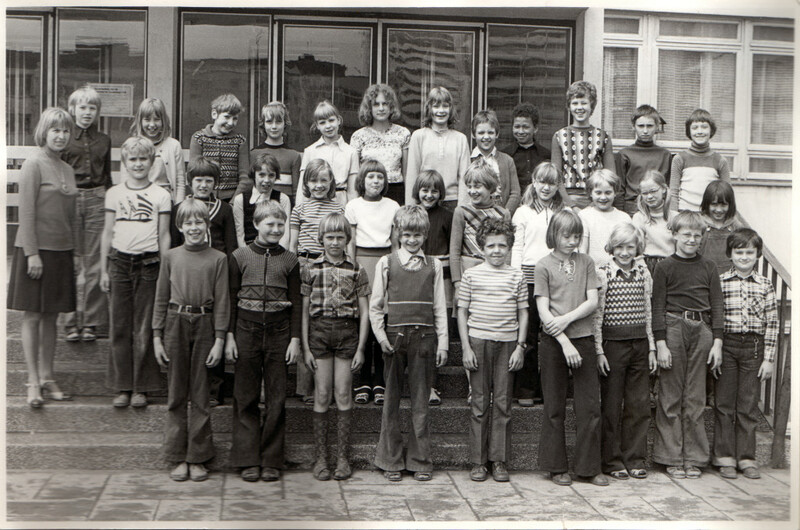 Class picture 1976/77. The author is in the top row, fifth from the left. I spent the evening with friends just a few blocks from the spot where World History was being made, and then: I went to bed. Yes, I slept right through this bit of world history, and while I slept, the pot didn’t just get stirred, it was knocked over and smashed to bits. The next morning I was told we wouldn’t need pots any longer. In the society I was born into, the government’s most exacting critics had surpassed their own government in their capacity for hope. I’d learned to hope, and also to understand what it meant for something to be provisional, and to have other ideas, and to wait. And now? Now the ones whose ideas had been criticized all those years were being not just replaced but cancelled out. And the critics were left sitting in an empty theater. There was a lot of talk of freedom, but I didn’t know what to do with this free-floating concept suddenly drifting about in all sorts of different sentences. The freedom to travel? (But what if you couldn’t afford to?) Or the freedom of expression? (What if no one was interested in my opinion?) A freedom to shop? (But what comes after the shopping trip?) Freedom wasn’t a gift, it was something you paid for, and the price of freedom turned out to be my entire life up till then. The price of freedom was having what had just been the present a moment before suddenly relegated to the past. Our everyday life was no longer everyday life; it was an adventure that had been survived, our customs now a sideshow attraction. Everything that had been self-evident forfeited its self-evidence within the span of a few weeks. A door that opened only once every hundred years was now standing ajar, but the hundred years were gone forever. From this point on, my childhood became a museum exhibit. When I picked up the newspaper not long ago, I read an obituary for my elementary school. It’s true, a few former students had gotten together and published a death notice for the building where I’d gone to school for eight years. In loving memory we mourn the demolition of our school. These former students —now adults, of course—spoke in this unusually long death notice not only of their grief but also of their everyday lives in and with this school, which had been constructed in 1973/74 in the valley between the East Berlin high-rises of Leipziger Strasse and the tall edifice of the Springer Publishing house in West Berlin. After the fall of the Wall, this building—a standard-issue postwar monstrosity—housed a high school for a decade or so, then was abandoned, then stood empty for another ten years, in the course of which it was overgrown with trees, bushes and weeds. A silent place, its grounds covering nearly a square kilometer if you count the sports area, just around the corner from the hustle and bustle of Checkpoint Charlie, the world attraction for visitors trying to get a sense of what the Wall felt like. And just a quarter of an hour by foot from Potsdamer Platz with its palaces of glass. Where else in all the capitals of the Western world might one possibly find a wasteland like this—earth lying fallow, dead, a defunct bit of everyday reality left over from another age? Ground Zero in New York became a construction site as soon as the rubble was cleared away, and a museum was built at its edge in memory of those who lost their lives in the attack on the World Trade Center. But no one died in our school. There had been, thank God, no war fought there, no attack. Once the building had been abandoned by school officials, all that could be seen in it was this new society’s appetite for developable property in a prime location. When I go to inspect the ruins, all I find still standing is a fragment of the rear staircase. These were the stairs that during my childhood still led up to the chemistry and biology labs. During recess, the boys from my class would stand in a tight circle in the alcove between the outer wall of the stairwell and the building proper, turning their backs on all the rest of us so they could smoke in secret. When one of them became my boyfriend, I was the first girl allowed to stand there during recess with the others, turning my back on everyone else. When a wall collapses, when a ceiling crashes to the floor, what happens to the curve of space-time? The disappearance of a place always occurs in two phases. I realize this only when I see, piled up beside the huge pile of rubble, the limp heap of red rubber mats that used to cover the sports area of the schoolyard. The first phase: the emptying out, becoming overgrown, collapsing but still remaining there—and then the second: the being swept away and replaced by some­thing new. Only after the sweeping, the clearing up, the being disposed of can something else replace the thing that used to be there. This desolate fermata in the district Mitte had nonetheless remained a sort of placeholder for my memories of the school, which—as is the wont with schools—was not always a happy place. As a wilderness in the middle of this quickly gentrifying neighborhood, this square kilometer was also something like a bygone era that gets stuck in the contemporary moment’s throat until finally it can be spat out. Only after the surface has been smoothed and scoured can the place that has disappeared and the time that disappeared along with it set off on their final journey, the journey to a purely intellectual realm, if you will, and from then on they exist nowhere else but, for example, within the convolutions of my brain, and in those of others, where they find in the memories of this or that person their final refuge. The open area in front of the main entryway was just big enough to allow all the students in the school to assemble there in rectangular formation for the flag ceremony. But we also gathered there when the principal had sounded the fire alarm as an exercise. And starting in April or May, we would assemble there for another purpose as well: jumping according to strict, self-imposed rules over elastic bands that had been knotted together and stretched between two pairs of girls’ legs. This was done with elastic designed for the waistbands of underwear, and at the time the game was known as Gummihopse (elastic hop)—these days it’s called Gummitwist. Level One: with the elastic at ankle height; Level Two: at the knees; Level Three: the hips. It was easier to carry out the various maneuvers required in this game with each foot separately than when you had to keep your feet pressed together as you jumped over the elastic. The stairs that led from this site of games, assemblies and fire alarms up to the main entryway is where the yearly class photos were taken as well, with the taller kids standing on the steps behind the smaller ones, like in choir. A schoolyard large enough for all the kids to assemble in rectangular formation for the flag ceremony (Where’s my blue pleated skirt? Where’s my cap? How come it won’t stay on? C’mere, I’ll stick it in place with a barrette. Stop, it hurts! ), a schoolyard like this is covered with paving stones, and because it’s paved, it’s perfect for jumping over a piece of elastic stretched between two pairs of girls’ legs. Saluting the flag can be a part of everyday life, just like a game that girls play when the weather is finally warm enough for knee-highs. In the place where this schoolyard used to be, there are no longer any children, and the words “flag ceremony” have now been phased out, rubble words. In the place that used to be kept empty so that orderly assemblies could take place there, chunks of concrete from the building are now piled up. This heap of concrete has something to do with me: one of the pieces, I see, has small blue tiles from the girls’ bathroom stuck to it. Did I like this bathroom? Is it even possible to like a bathroom in a school? Aren’t I looking forward to the future, to the light-flooded apartments or offices, for example, that will soon rise in the place of this erstwhile Socialist school bathroom? Edifices of granite, steel and oak replacing the classroom walls with their bulletin boards featuring articles with headlines like: Mere Sparks Gave Rise to Flames!, and soundlessly closing elevator doors in what used to be open air where children responded to the exhortation: For peace and Socialism be ever prepared! with a snappy or sleepy: Always prepared! Was that it? Strangely, it’s not so important whether the thing being replaced was delightful or deplorable, good or evil, honest or dishonest. It is simply a matter of the time that once passed in this familiar way—this way familiar to me—and still lingered in these spaces. What is at stake is time that used to be the present: a universal present that happened to contain my own private one. Time that included a particular notion of the future, a notion familiar to me, even though this future still lay far in the distance. Even the future isn’t what it used to be—a brilliant observation by Karl Valentin. Meanwhile I know what became of that lofty future we were being prepared for in this school. The long haul, often referred to by Brecht’s phrase the labors of the plains. These plains were too extensive. But now? Now we have a future again. Or have present and future been conjoined for all eternity? And when the ruins are cleared away once and for all, will the past have been cleared away too? Are we now arriving in a time that will retain its validity for all time? Now that the basement that sometimes was transformed into a vaccination center, and the cafeteria that sometimes still served dishes like blood pudding with sauerkraut, and the auditorium where our pictures from art class adorned the walls have all become a pile of rubble, I can see that in accordance with the two phases of disappearing I mentioned before, my mourning too has two phases. With the gradual disintegration of this place I was first just concretely mourning the loss of the vaccination center, cafeteria and auditorium—not the rooms themselves, of course, but these rooms as the gradually rotting backdrop for the quotid­ian reality of my childhood—as though a reality like this, long gone, might retroactively grow old and weak. But now that the rubble is being swept aside, a more funda­mental sort of mourning is beginning within me, one that extends beyond my own biography: mourning for the disappearance of so visible a wounding of a place, for the disappearance of sick or disturbed objects and spaces that bear witness to the fact that a present can’t just come to terms with everything, finish it off, settle things once and for all. In this second phase, the phase of cleansing, I mourn the disappearance of the incomplete, the broken, of what has visibly refused to let itself be incorporated—the disappearance of dirt, if you will. In places where the grass just grows, where garbage piles up, a relativizing of human order sets in. And given the fact that we ourselves are mortal, every one of us, this is never a bad thing to ponder. When the Socialist architects tried to lock out evil spirits, there was fortunately not enough concrete, or else it sprang a crack. It was also more than anyone could achieve at one go. Replacement parts were problematic. And besides: To whom does the property of the people really belong? Whose business is it? During my childhood, everything I saw in this city bore witness to how little time separated the present day of the Socialist experiment and the present day of wartime. The incomplete and the vision of a lofty future, ruins and the construction sites of the new world still existed side by side, always open to view. Arisen out of ruins and toward the future turned was the first line of the GDR’s national anthem—one could not be imagined without the other, no future without ruins. And a child starts by learning only through the things that are there, children learn by seeing what is there, the things that exist side by side. Stories get added to this only later, and one’s own experiences. For children, ruins from another age that they find waiting for them when they are born—just like hospitals in which they have not yet seen anyone close to them suffering, or cemeteries in whose earth they have not yet had to bury a friend, a grandmother, a grandfather, father or mother—are not yet sites of mourning. Not even sites of fear, because a child does not yet have enough experience to be afraid. What I’m going to call my love of dirt, the incomplete, and ruins was still pure and untainted when I was a child, and my learning took place only through the presence of damaged places and sites of this sort, through their very existence and the fact that I was sharing my life with them. During my childhood, ruins were an everyday sight—these very ruins that had cost me nothing since I had been born into their reality. Didn’t my first rendezvous with the aforementioned boyfriend from my class at school take place in the ruins of the German Cathedral, amid the weeds and jagged blocks of stone? Hadn’t I climbed a birch tree whose strong branches reached to the second floor of the ruins of the New Museum, making my way to the half of the museum corridor that still remained, in order to look at statues no one else knew about? These statues were supposed to be torsos, but a war that had nothing to do with them had truncated them further. Hadn’t my father, every time we drove past Alexanderplatz in our Trabi, pointed out the construction fence across from the Red Rathaus, reminding us of the mummies dating from the Biedermeier period that he had found as a student in the catacombs of St. Nicholas’ Church, undamaged by bombs, which were no doubt still buried beneath the rubble of the bombed-out block? I knew the bullet holes around the foundations of Humboldt University and the State Library and all the other grand edifices of Berlin’s Mitte neighborhood, I always knew what it looks like when a tree starts growing out of a roof gutter, knew what it’s like to look out your window at an air-raid bunker, and knew the faint differences of hue that made it possible to look at an old tile-covered wall and see where there used to be a bathroom, a kitchen, a pantry. Girders. Charred beams. Walls with nothing behind them. Rooms in which dead pigeons get rained on because there’s no roof. Firewalls that create attractive silhouettes at sundown. Roped-off properties. Vacant lots and dead ends in the middle of Mitte. As I child, I loved the ruins. They were secret places, aban­doned spots where the weeds grew as high as your knees, and where no grown-ups would follow you. Sometimes they were dangerous places, too, places with gorgeous views, places where we could make discoveries that belonged to us alone. Peaceful places where nothing happened except that clouds passed by overhead. Places from where you could look up through several floors and burnt-out window frames and see the sky. Places where shepherd’s purse grew—you could eat the hearts. They were places that were landscapes in the middle of the city. It was many years before I realized that these places so familiar to my childish gaze were in truth a bygone era that had been wiped out, an era that sticks in the contemporary moment’s throat until finally it can be spat out. To be sure, there was one difference: At the time, it didn’t cost anything to have the ruins there. Time wasn’t moving forward, it was at a standstill. No one talked about money. The private ownership of property had been abolished. Real estate was nothing more than real. Probably it was during this period that I learned to live with the incomplete and also with the awareness that buildings that have been constructed for all eternity do not last for all eternity. Not until I was grown did I learn that Hitler had planned the monumental buildings for his “Thousand-Year Reich” in such a way that they would make excellent ruins when the thousand years were up. Looking at the ruins of Berlin at the time, it was easy to study what remains when a cupola is destroyed, or a department store; one could learn without much effort that it was perfectly possible to live in the bottom two floors of an apartment building even if the top two floors had been destroyed by bombs. And this knowledge is of a sort that cannot be forgotten again. Even today I find myself automatically converting shopping arcades into the ruins of shopping arcades, I make clouds of dust rise up in elegant boutiques, imagine the glass walls of office buildings splintering and raining down, leaving behind naked offices with no one sitting in them. I know perfectly well what it would be like if all the rubber plants in living rooms and all the geraniums on balconies dried up because there was no one left to water them, or because the ones who were left behind had more urgent matters to attend to than watering the plants. I see fountain basins filled with debris, see streets that are impassable and consider which pieces of my furniture might be left standing on a bit of floor if the apartment itself no longer existed. I’ve always also known how the people sitting across from me on the subway—children, teenagers or adults in the prime of life—would look at the age of 80, I couldn’t help converting these people into their own ruins: the infirm, wise, ravaged or overripe ruins of faces and bodies, I knew all about the decline awaiting them and kept seeing it in different forms. This compulsion has remained with me to this day, as if the decline of all that is were just the other half of the world without which the rest too would be unthinkable. And at the same time, I myself was living in the middle of a construction site that could only be there because before it there had been nothing or almost nothing left—without my being conscious at the time of what I was experiencing. That’s no doubt how it always is: It takes you an entire lifetime to make sense of your own life. Layer after layer, knowledge piles up atop the past, making it look again and again like a brand-new past you have lived through without actually knowing it. I begin my life as a schoolgirl, then I grow, and the buildings surrounding ours grow as well. My own conscious life was accompanied by the Socialist life of Leipziger Strasse, which today leads to Potsdamer Platz but at the time came to an end at the Wall. Today I know that one hundred years ago, Leipziger Strasse was a narrow, popular and highly populated commercial street filled with tobacco shops, horse-drawn streetcars, sand­stone curlicues on the buildings and women with fancy hats. There were still Jewish-owned textile mills in the neighborhood at the beginning of the 1930s. But by the time of my childhood, none of this was left, and I didn’t know there was something missing, or someone. Today I also know that the tall buildings, like the one I lived in, were constructed with propagandistic intentions as a response to the Springer Publishing headquarters on the West side of the Wall, but as a child, I simply enjoyed all the lights we could see on the other side from the terrace above the 23rd floor. As schoolchildren, we read the time for our Socialist recess from an illuminated clock display in the city’s Western half that was visible from our side of the Wall. That the building to which this display was affixed also bore the illuminated letters “B.Z.,” advertising a newspaper we’d never heard of, was of no interest to us. For our Sunday walks, my parents would bring me to the end of Leipziger Strasse, to the area right in front of the Wall, where it was as quiet as in a village, there was smooth prewar asphalt there, perfect for roller-skating, and here was also the final stop on the bus line, no through traffic beyond. This was where the world came to an end. For a child, what could be better than growing up at the end of the world? When I was a child, the one half of the city was a whole city for me, and even today it’s only my mind and not my feelings that understand that the city is only now functioning again the way it was built and intended. For example, I can drive down Chausseestrasse a hundred times—a street that leads from the East Berlin district Mitte to the district Wedding in West Berlin, now a perfectly normal street again—and one hundred times I will be driving through a border crossing. This growing-together-again of the city is for me not a growing-together-again, it’s a perfectly arbitrary addition, just because as a child I didn’t experience the two halves of the city as belonging to a single city. I see how in the half I know so well the functions of a capitalist metropolis move back into the buildings that belonged to them fifty years before and suddenly comprehend that these buildings knew more all along than they were able to tell me. One building bears the inscription “House of Switzerland,” and I’d always wondered why this oddly constructed building, planted amid all the Socialist linden trees with a grocery store on the first floor, bore such a name. Now the building is back in the hands of the banks and insurance companies that first built it. And still: something I failed to learn with the feelings of a child still eludes me now, with my grown-up feelings. Someone like my old neighbor, who always bought his breakfast rolls across the street before the war—in a place that suddenly became the West and inaccessible—no doubt had the inverse experience. With his childhood feelings he got to know all of Berlin, and for him, the Wall can only have been a subtraction for those twenty-eight years. When I was a child, I didn’t distinguish between the ruins left behind by the Second World War and the vacant lots and absurdities of city planning that came about when the Wall was built. For me, with my 1970s childhood, the buildings still bearing inscriptions in the Fraktur script so beloved of the Nazis (“Molkerei” or “Kohlehandlung”) long after the dairy and the coal merchant had closed up shop, were just as familiar a sight as the blocked-off entrances to the subway stations that had been closed when the Wall went up. The wind blew old paper and dry leaves down to the foot of these stairs that no one descended for thirty years. The sounds made by the West Berlin subway lines that ran beneath East Berlin without stopping could sometimes be heard through the ventilation shafts all the way up to where we children of the East were standing, and we also knew the warm air that would waft up to us from these inaccessible tunnels. But we learned that just as municipal dairies and coal merchants could disappear forever, there were also paths beneath our feet that were not meant for us, even that there were airplanes flying above our heads in which we would never travel. We heard the workmen on the construction scaffolding in West Berlin hammer­ing and drilling and knew that an entire world that seemed so close could still be inaccessible. At the same time, though, we learned that if you look at it from the other way around, besides the world we knew, there was a second world that existed quite close to us. We learned without learning—only by existing in this city and living this life—that the things you could grasp were not all there was. That other worlds were hidden in the earth we walked over and in the sky whose clouds drifted untouched above East and West alike. For me as a child, an empty space did not bear witness to a lack; instead it was a place that had either been abandoned or declared off-limits by the grown-ups and therefore, in my imagination, belonged entirely to me. Often, visiting my grandmother, I would stand in the living room behind the curtains, looking at the large building that could be seen behind the Wall, over there. It might have been a school, or a barracks. In the mornings, the sun would shine brightly on its walls. I liked this building and wondered what sort of people lived or worked there. The wall separating me from the part of the city where this building stood, and the barbed wire barrier in front of the Wall, and even the strip of sand under the barbed wire, which probably had land mines hidden in it, and the border guard who was patrolling right beneath where I stood, were of far less interest to me. While my grandmother was cursing because a dust-rag she had hung over the railing of the balcony to dry had been blown down into the border strip—now it was lost to her forever—I stared at this building. In the evenings, its windows remained illuminated for a long time, every window with the same neon light, so probably they weren’t apartments after all. An empty space is a place for questions, not answers. What we don’t know is infinite. My aunt, the one who always sent me the greatest “West packages” from the other half of Berlin, lived on Sickingenstrasse. The address was on the package. Sickingenstrasse. My entire childhood I thought it was the “trumpeter of Sickingen” in the legend, but really it’s the “trumpeter of Säckingen.” And the trumpeter of Säckingen—as was clear to me even then—could not possibly be the same trumpeter I was thinking of when I sang the “Song of the Little Trumpeter”: “Among all our co-omrades, not one was so fine, as our little trumpeter, the Red Guard’s pride and joy, the Red Guard’s pride and joy.” But for a child it’s not particularly surprising for the Baroque bourgeois trumpeter from Säckingen to be singing Erich Weinert’s Communist trum­pet song in the inaccessible Sickingenstrasse in West Berlin, a song that used to move me to tears every time, and so for me, as a child, Sickingenstrasse was a lovely street, a lovely street in the inaccessible West, where everything was fragrant with Ariel laundry detergent and Jacobs Krönung coffee, while the little trumpeter dies a heroic death, melodiously, as well he must. After the fall of the Wall, I then visited my aunt at some point, and of course Sickingenstrasse turned out to be not lovely and fragrant but instead loud and dirty, and my aunt’s apartment was in a modest 1950s housing block, a dark one-bedroom flat with low ceilings, a wall unit, collectible teacups and an L-shaped sofa. I peeked behind the window curtains and saw the building across the way with its sign reading “Unemployment Office” and the many sad-looking men standing in front of it, apparently waiting for the office finally to open. Even with the window closed, I could hear the din of the nearby freeway in my aunt’s quiet living room. The newly accessible West didn’t look, smell or sound anything like the West still blossoming inside my head. On the other side, though, the Unknown filling up with stories like a vacuum was probably just as great. East Berlin was gray, said people who had ventured from the West into the city’s Eastern half. Only now am I able to imagine what an adventure it must have been to pay your entry fee and then find yourself in the forbidden zone. When as a teenager I lived near the Friedrichstrasse border crossing, Westerners who hadn’t managed to spend all the money they’d been forced to exchange sometimes handed me twenty-mark bills. These Westerners looked as though they were a little ashamed to be treating me like a beggar, and they also looked as if they didn’t have a clue as to how things actually worked here in the East. They looked as if they were glad to be able to go back to where they knew their way around. At the same time, East Berlin, it seems to me today—now that I know the West perfectly well—probably wasn’t much grayer than the city’s Western half, it’s just that there were no billboards and neon signs hanging on the bullet-pocked walls in front of the vacant lots full of rubble. Admittedly, the plaster was crumbling from the walls of buildings in Prenzlauer Berg, and some of the balconies were no longer safe to stand on, true. The front doors of the buildings were never locked because private property was not an issue, and for that reason drunkards would sometimes take a leak in the entryway, I’ll be the first to admit it. But I remember above all—leaving aside the question of the grayness—a sort of almost small-town peacefulness that made a deep impression on me as child, a sense of being at home in a closed-off and for that reason entirely safe world. Seen from the outside, there may well have been something exotic about our Socialist reality, but we ourselves saw our lives as neither a wonder nor a horror—life was just ordinary life, and in this ordinariness we felt at home. The only thing that connected us children with the so-called wider world out there was, on the one hand, the West packages (which not everyone received) and, on the other, international solidarity, the worldwide struggle for the release of Luis Corvalán or Angela Davis, for example, which we as schoolchildren translated into readily comprehensible “sandwich bazaars” or “scrap material collections.” My parents filled their home with Biedermeier furniture and used money that weighed no more than play money. The lack of agency didn’t hurt as long as there was no agency. As a child, you love what you know. Not what grown-ups think is beautiful, or strangers; no, you simply love what you know. You’re glad to know something. And this gladness sinks into your bones and is transformed into a feeling of being at home. As for me, well, I loved this ugly, purportedly gray East Berlin that had been forgotten by all the world, this Berlin that was familiar to me and that now—at least the part where I grew up—no longer exists. When my son and I are in the country in the summer, sometimes we roam around, crawling under fences that have been blown over and knocked full of holes to access abandoned plots of land once used for company holidays, we open the doors of empty bungalows, they aren’t even locked, and silently gaze at the carefully folded wool blankets at the foot of the bunk beds, the curtains that were neatly drawn shut before some departure long, long ago, and the Mitropa coffee cups that someone washed and put away in the kitchen cabinet twenty-five years ago. Without saying anything, he and I gaze at all these things that have been preserved unchanged as if by a magic spell, ever since the last Socialist vacationers spent their holidays there just before their companies were “phased out” at the beginning of the 1990s, transforming an absence that was to last only two days into an absence forever. Now forever it is time for “milk break” in the museum of my memory. I am drinking vanilla-flavored milk from a small triangular container, the opening gets soggy as you drink. I am thinking of the mechanical pencils we would take apart to use the barrel as a blowgun for launching little balls of paper, of the notes we would write and pass around, the fits of hysterical laughter that would overwhelm my best friend and me in the back row. I can still remember how we rocked in our chairs or propped open our pencil cases to play with pins, buttons and erasers behind them, and I can also clearly remember the morning when I had to show up for school with glasses on my nose, and everyone said I looked like Lilo Herrmann, the antifascist resistance fighter whose picture was in our textbooks and whom we had declared hideous on account of the horn-rimmed spectacles she wore. My most vivid memory, though, is of the day when I stood up in the middle of class, walked across the room and slapped the face of the boy who was always teasing me, to get my point across—and then got slapped back by him: an extremely unchivalrous and therefore unexpected revenge. When recess came, the red mark on my cheek was still visible. A few days later, it seemed perfectly understandable that this boy should be my boyfriend. The place where all of this took place is now as flat as a book that’s been closed again. I am standing beside it thinking: That’s where I learned to read. A desert isn’t the opposite of a moun­tain, it’s a mountain that’s been scattered, mountain climber Reinhold Messner once said. My perfectly normal schooldays, which in the end were not very different from a thousand other schooldays, became extraordinary thanks to the destruction of the site where they took place and the disappearance of the society that left its mark here. All these things that can no longer be seen here are now inside my head, more vivid than ever. Of course, this will only be the case for a certain length of time, for memories are inscribed in mortal flesh, and so the older I become, the more blurry and indistinct they will become, until eventually they will be swept away along with me, so that in the place where I used to walk around with my memories of all sorts of things, someone else will be able to walk around, remembering something else. Memoir from the Winter 2015 issue.